Ah, Noble Basketball, the sport of people who wanna Slam with the Best. But what if you've already Slammed with the Best, Jammed with the Rest, and Need More Opportunity to Dunk? HammerBro gives ya an outlet with their jam submission Basketball 2. 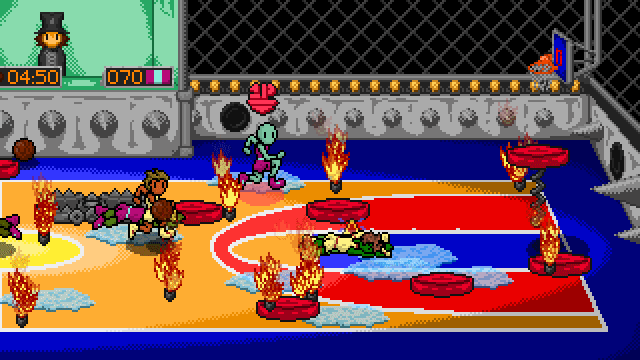 Play against AI or 'Meat Friends' in this souped up sequel to Basketball, where traps and court effects change the very nature of the game. I dig the audio work here, the jams are chock full o' synthy goodness and the sound effects nicely sell the action and feel appropriately matched to the visuals, both of which would feel right at home on the genesis. They're polished and cohesive as heck, so excellent work on 'em! I really like da giant Robotnik-ish announcer sprite haha. 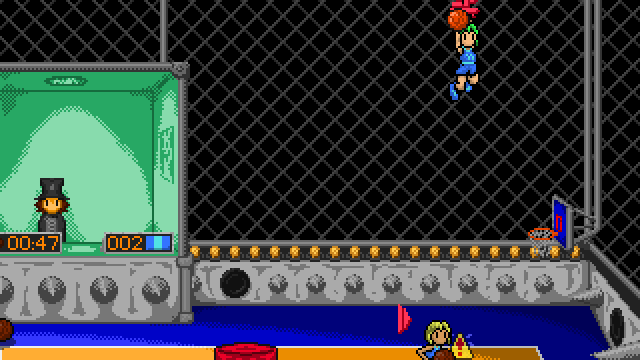 I do feel the use of theme here is a little weak, with Basketball 2 feeling more like a mix of Super Dodge Ball and NBA Jam and taking them farther with traps and absurdities, but not really elucidating on why it's an unnecessary sequel. It kinda works if ya say 'well, normal basketball doesn't need additional mechanics!!' I guess, but this version is a lot more interesting to me haha. A little bit of narrative or additional theming to help sell that angle would have been nicely supportive and integrated the jam theme more strongly. The chaos of matches, especially if you increase the trap spawn rate, is really fun! The AI is quite strong to begin with, I think just about everybody is destined to lose their first game against it, so a bit of tutorialization is probably warranted here. But after a match (and, pivotally, understanding that extra balls can also score points) it becomes a lot of fun to challenge them. 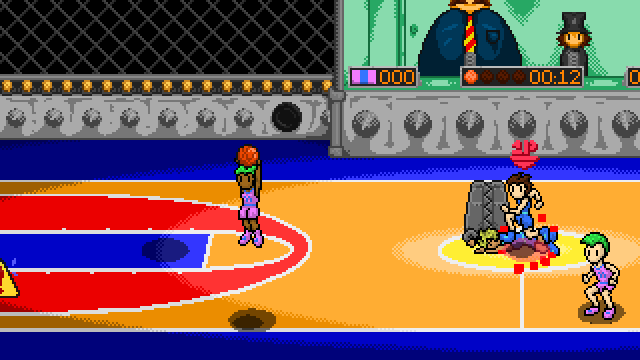 There feels like a nice variety of tactics, from playing fairly straight bball to picking up your opponents and chuckin' them to their doom or your net. Though there is a core issue with those balls and traps in general: since the camera is generally locked onto the 'true' bball, it's super easy for important action to be off screen. It can be really disorienting and annoying to deal with if your controlled character isn't visible (ya can't tell if they're stunned, or respawning, or whatever), so at least for single player I think ya wannna always keep them visible. It's also a bit strange since ya have a full court zoom in at the start of the game which feels like it'd nicely show all the action, but I'm guessing details are hard to make out in that mode so ya didn't use it during normal gameplay. Finding some sort of way to deal with this would be really nice though! A bit more mechanical variety, such as special abilities or powerups allowing you to really wreak havoc on the court or to make point turnarounds, would be a wonderful supportive element. 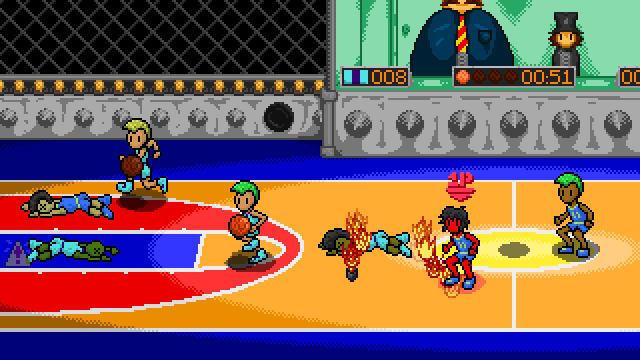 But what's here is already pretty robust, with traps and straight up brawling creating a chaotic, unique take on bball. Nice work! Shoot, sprint, shove, dunk and arson your way to victory. 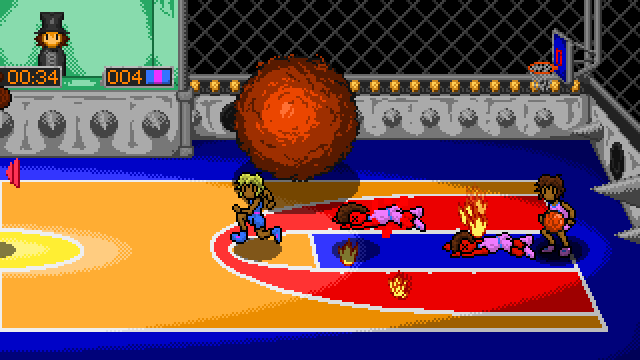 Basketball 1 was doing just fine and also it's no longer the '80s but we made a logical, historically-accurate successor anyway. The gameplay is wonderfully silly and chaotic. I like how you can just pick up the opposing player while they're still holding the ball! My main complaint with the gameplay though is I found the controls a little confusing. I wasn't really sure what the "shove" command did and there seemed to be no way to control where the ball went when you tried to dunk it, usually leading the ball to fly off at near lightspeed away from the basket I wanted it to go towards. Shoot, thanks; I would not have expected self-extracting archives to be considered installers. I'll stick to the suboptimal but universal compression of zip next time and trust that people will extract the whole folder instead of just double clicking on things next time. Just a heads up, your game uses a self extracting archive which is technically a violation of the rule against installers. We talked it over and decided to let it slide in this instance as it doesn't do anything more than unzip the files into the target directory. In the future we're going to clarify the rule to also include self-extracting archives. tldr: You're fine, just don't use self extracting archives in future Awful jams. 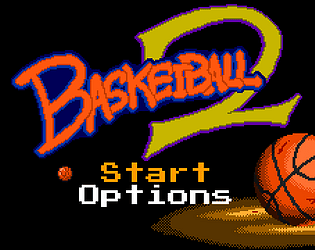 It's a fun game that doesn't feel too simple or too boisterous as many sports games tend to. It's got funny little moments and a solid loop and an expected annoying computer to play against. Passing would be cool, though I never use it, but it would expand the perceived space of mechanics. The art is nice on the whole and again, the sound is appropriate and enjoyable. Theme adherence is middling, because it's basketball with more stuff, but it doesn't feel like it's been really necessitated or established why or what specifically caused it. It's a good bit of fun to play and I'll likely revisit it soon. Lol, crap, I guess neither of us is that original of a person. Same name, even. May the best Basketball 2 win. A fun game with a cool coherent art style. Plays well, but it's hard to know sometimes whether you have control over the player or not.